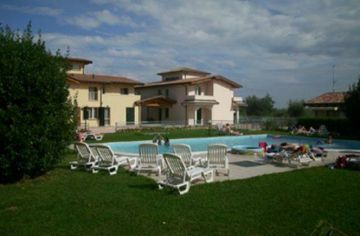 This apartment is part of a rural farm (agri-tourism) located on the southeastern shore of Lake Garda. The estate is beautifully situated amidst olive groves and green fields just a few kilometers from the lake and the center of the picturesque village of Salò. The estate consists of 22 houses which have been completely restored plus an old tower which dates back to 1400. Guests of the estate may use the pool with its chairs, loungers and parasol. The complex is surrounded by 13 hectares of green hilly area which contains a private lake. There is also a private parking lot here. In the area of the estate you'll find a farm that produces its own olive oil. In the local restaurant (on the estate) you can taste delicious products from the region. You can also order a delicious breakfast. Only 100 meters from the farmhouse there is a shopping center and a pizzeria. Near the estate there is a 9-hole golf course. Guests of the resort have free use of the driving range and will receive discounts off the green fee. Manerba del Grada lies in the middle of theValtenesiValley, which stretches as far as the great rock of 'La Rocca'. On this cliff you'll find the ruins of Chateau La Rocca. From here you can enjoy a breathtaking view of the lake. In the environment you will also find vineyards, historic villas and picturesque villages. In Manerba you will find more than 11 kilometers of beautiful beaches. From the farm you can take exciting trips, for example to historic cities likeVeronaandVenice. In summer, visit the centuries-old Arena di Verona, where classical operas are still performed. In the vicinity there are also several markets you can visit: Salò San Felice del Benaco, Desenzano del Garda, Moniga del Garda, etc. In terms of recreation and sport, the offering is sufficient to attract you. There are many sports opportunities in the area including windsurfing, sailing, kite surfing, canyoning, mountain biking and trekking on horseback. This apartment is located on the first floor and has an area of approximately 140m². The house can accommodate up to eight persons. The living room has a sofa. The kitchen, which adjoins the living room, is fully-equipped including a 4-burner gas cooker, microwave, fridge/freezer and kettle (upon request, an Italian coffee maker). There are four bedrooms, each furnished with a double bed. There are two bathrooms, both with a shower and toilet. This house has a balcony and a terrace with garden furniture. Each home is modern and comfortably furnished with heating, air-conditioning, a TV with satellite connection and private parking. The price includes: - Gas / Water / Electricity - Use of the pool and accompanying garden furniture - Parking. - Heating is according to consumption and is billed at the rate of 1,50 euro per m³. - Air-conditioning consumption 8 euro per day. Arrival is on Saturday. If you would like to arrive on another day please contact Tour Operator.